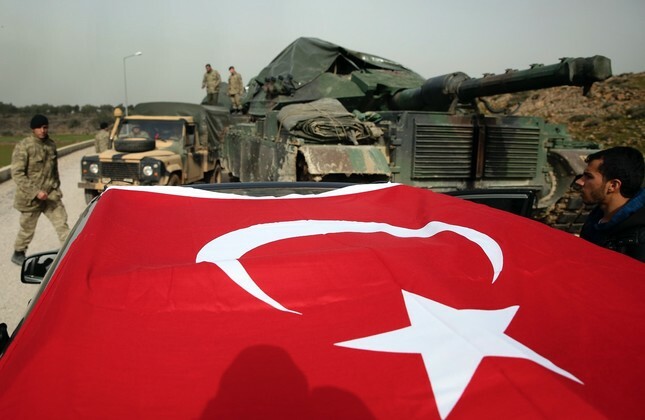 Turkish soldiers prepare tanks and armored personnel carriers at a staging on the Turkish-Syria border, Jan. 22. COLUMNS Who harms NATO? Turkey or the US? To be clear, the West's refusal to view the YPG as a terrorist organization and the Western media's romanticization of "the Kurds" reflect an eagerness to stop Turkey's fight against the PKK/YPG. As a matter of fact, they would like the Turkish government to negotiate with those organizations - recalling that Turkey hosted the Democratic Union Party (PYD)/YPG leaders and engaged in disarmament talks with the PKK just a few years ago. In other words, President Recep Tayyip Erdoğan's past efforts to disarm the PKK are being repurposed as an obstacle before Turkey's fight against the same group. Needless to mention, the domestic opponents of "the war" and a smear campaign against the Free Syrian Army (FSA) serve the same purpose.Again the backdrop of those developments, The New York Times recently urged the U.S. and NATO to force President Erdoğan to relaunch the peace process. They ought to tell the Turks, the paper's editors argued, that a semi-autonomous region under YPG control would pose no threat to Turkey. They added that the "Syrian Kurds" needed to ensure Ankara that they would not cooperate with PKK militants in Turkey and to accept that their autonomous region in northern Syria would never become independent. First, it fails to take into consideration that the PKK walked out of disarmament talks twice, despite efforts by President Erdoğan, in an effort to keep its "cantons" in Syria. Against the backdrop of negotiations with Turkey, the organization strengthens the PYD/YPG in Syria and laid the groundwork for what came to be known as the "trench war" in southeastern Turkey. As such, there is no reason to believe that the PKK would give up its claims in Turkey in return for the "cantons" in Syria. It would only use this trade to win some time and gain legitimacy.